Spanish cartoonist, born in Barcelona, Spain, in 1840. During his short lifetime Tomas Padro established himself as the most popular and creative cartoonist in Spain. 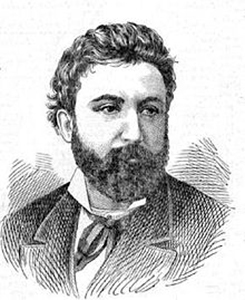 From 1858 to 1877 he contributed to El Tiburon (1858-65), Lo Xanquet (1865-74). Un Tros de Paper (1865-66), Lo Noy de la Mare (1866-67), La Risotada (1869-73) and La Madeja Politica (1873-76). All these publications were humor magazines unique for their time. Though shortlived, they had a significant cultural impact throughout Spain. (La Risotada, the most important of them, underwent a scries of name changes, and its entire history is not fully clear to this day. It is known, however, that La Risotada. Lu Flaca, La Risa and La Carcajada were all basically the same magazine). Padro received his greatest recognition for the color cartoons he drew for La Flaca toward the end of his life. These cartoons testify to his keen political insight and his outstanding artistic abilities. Not only was Padro an excellent draftsman, but he was also a good painter, and several of his works are on permanent display at the Museum of Modern Art in Barcelona. At the end of his short life he was a professor at the School of Arts in Barcelona, where he died in 1877. In the opinion of some of the most respected critics of Spanish cartooning, Tomas Padro belongs in the ranks of the great European draftsmen of the second half of the 19th century.